Fast optical sectioning at a fraction of the price. Robust optical sectioning with superior speed and contrast. Optical sectioning reveals 3D information through sequential imaging of adjacent sample planes. Sectioning relies on rejection of out-of-focus elements from adjacent planes that tend to confuse the end result, and high-quality results can be costly. The future of optical sectioning belongs to systems that provide high contrast and resolution at a low cost. 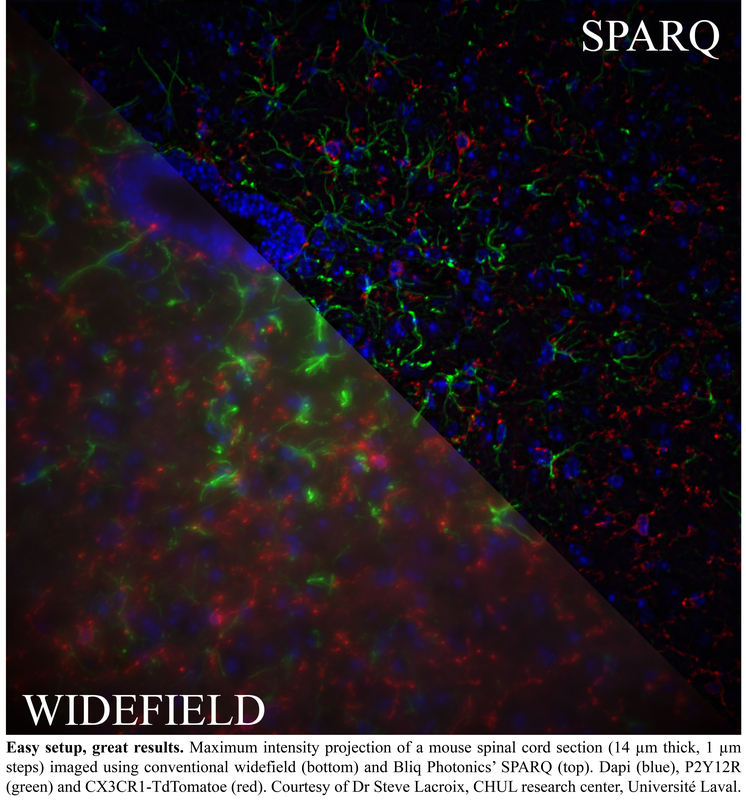 Supercharge your widefield fluorescence imaging with SPARQ and see clearly how Bliq’s team is improving microscopy. Going light on your budget has never looked so good! Bliq Photonics’ Sparq is a reliable and compact system that enables any widefield microscope to perform high contrast non-scanning optical sectioning up to 10 frames per second at 2048×2048. Sparq is available as a complete imaging system (from lasers to microscope to camera) and as an upgrade to widefield imaging systems. Based on patented HiLo technology, the Sparq module produces sharper and more high resolution images from live or fixed samples. The result is a dramatic improvement in image contrast and spatial resolution that rivals the performance of more costly laser scanning technologies. Maximum intensity projection of a mouse kidney section (16 µm with 1 µm steps) using a commercial widefield microscope without (left) or with Sparq (right). See as deep as a confocal system. Bliq Photonics’ Sparq widefield imaging system still provides high resolution and contrast at a depth of 100 µm in fixed tissue sections. Maximum intensity projection of a mouse brain hippocampus (100 µm) with 0.5 µm steps using Sparq (left) or LSM (right). Courtesy of Jerome Mertz, Boston University. 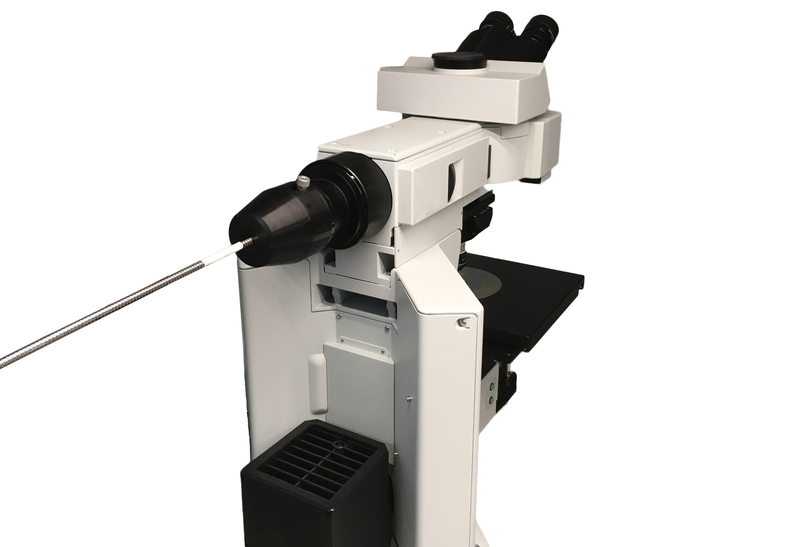 Upgrade your widefield microscope with optical sectioning. 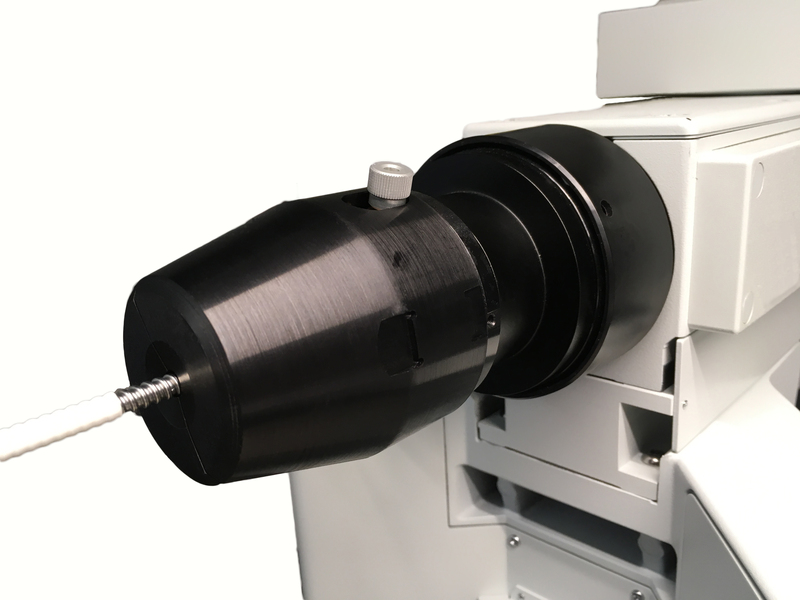 Cost-effectively improve the axial resolution and optical sectioning of your existing widefield microscope using the Sparq module. Bliq Photonics’ compact solution includes a laser combiner with up to 7 excitation wavelengths, the Sparq module, a 2048 by 2048 sCMOS camera, an Apple computer/monitor, and Bliq’s Nirvana imaging software. 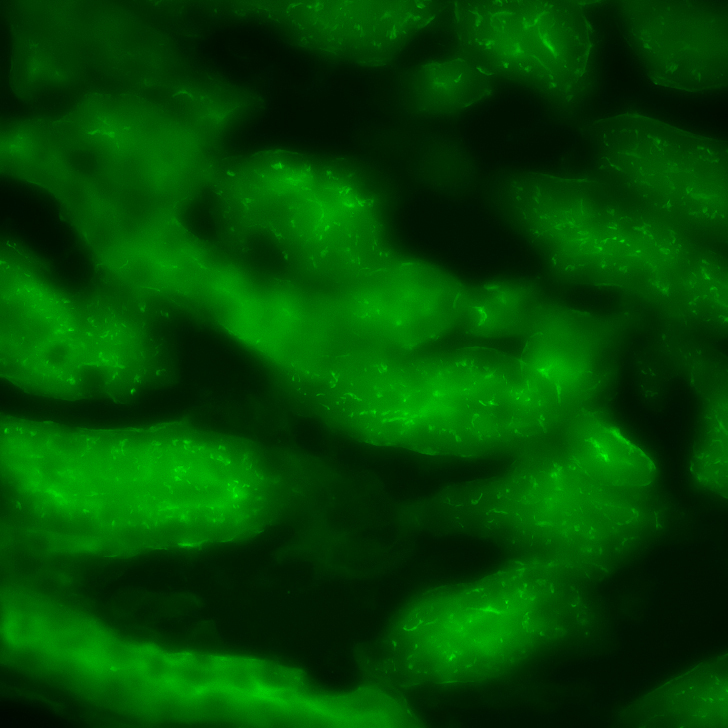 Importantly, the Sparq add-on still allows your microscope to perform conventional widefield imaging. Comparison between conventional widefield (top), Sparq (middle) and laser-scanning microscopy (LSM, bottom). The Sparq technology rapidly removes out-of-focus elements using two differently illuminated images that are mathematically processed, producing high resolution and high contrast optical sectioning at 10 full FPS at 2048×2048 pixels each. Here are two examples of complete Sparq microscopes, one for live cell imaging, the other for fixed tissues. Please note that all components of the proposed Sparq upgrade can be modified to fit your particular needs*. *Compatibility of the equipment cannot be guaranteed and must be verified with Bliq Photonics’ team. Optically sectioned in vivo imaging with speckle illumination HiLo microscopy. (2011) Lim D, Ford TN, Chu KK, Mertz J. J Biomed Opt, Vol 16(1), (PubMed). 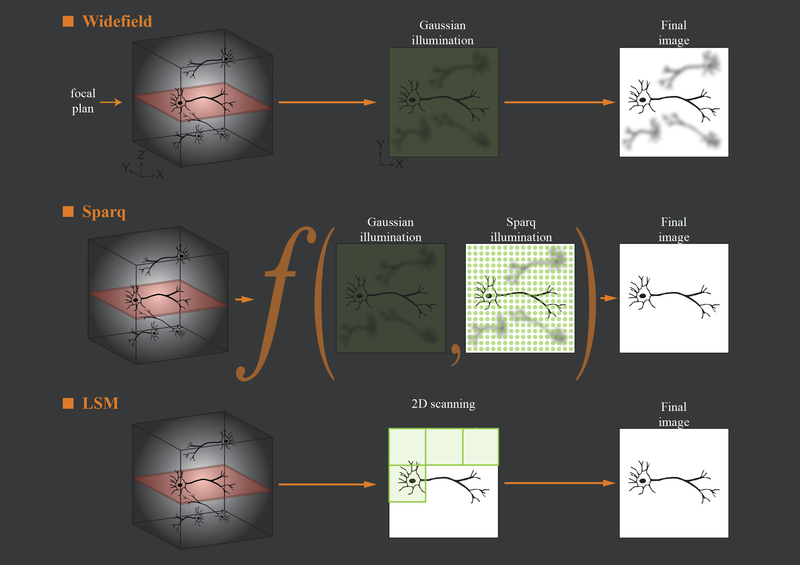 Wide-field fluorescence sectioning with hybrid speckle and uniform-illumination microscopy. (2008) Lim D, Chu KK, Mertz J. Opt Express, Vol 33, No 16. (Pubmed).